As temperatures drop, New Englanders prepare for the cold by filling their bellies with food that is best slurped and sipped. That means ramen, of course. 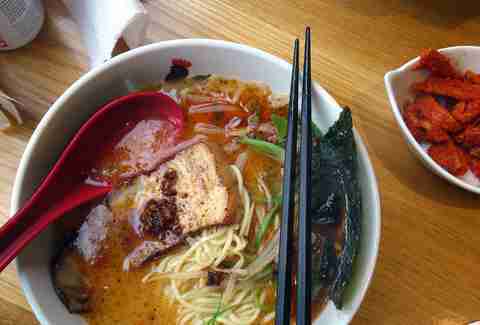 And while instant-noodle packets like Maruchan and Top Ramen have their place, you can find tastier takes on the popular Asian noodle bowl all over town, with more popping up every year. Every region of Japan has their own take on the dish, and most of them are available in noodle nooks around the Boston area. 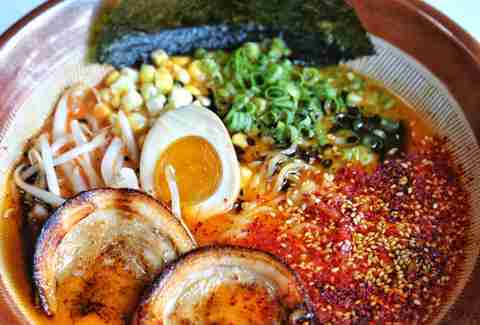 Below is a list of our favorite ramen restaurants. Some specialize solely in ramen, some offer ramen alongside other Japanese delicacies, and some aren’t ramen restaurants at all—but just offer a unique take on an ancient recipe. Enjoy. 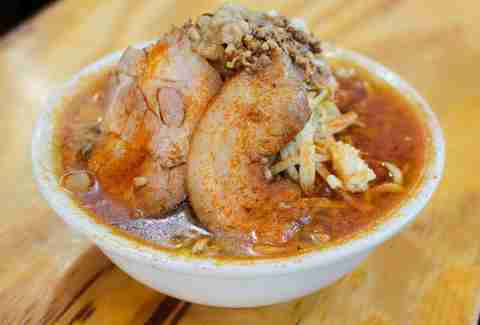 One of the most renowned ramen locations in New England, Yume Wo Katare is laid out like a classroom with communal tables facing the chefs who are hard at work churning out bowl after bowl of Jiro-style ramen. You’ll only find one style served here, so you know it has to be good. After all these years, customers still only have to make two choices when it comes to ordering -- whether or not you want a mound of fresh garlic and whether you want two or five slices of pork. Sorry, vegetarians, you’re out of luck. This decadent broth is made from slowly simmering pork bones for over 24 hours, and the super thick noodles are made in-house. A warning to the shy, Yume Wo roughly translates to “talk about your dreams,” and diners here are encouraged to do just that. After finishing (or trying to finish) your hearty bowl, customers are asked to stand and share their life goals in front of fellow patrons...while the noodle master grades your attempt to finish your meal. Nearby in neighboring Newton, you’ll find Little Big Diner. Little in size and huge on taste, the suburban sensation’s pan-Asian menu offers five varieties of ramen and a seasonal selection to boot. 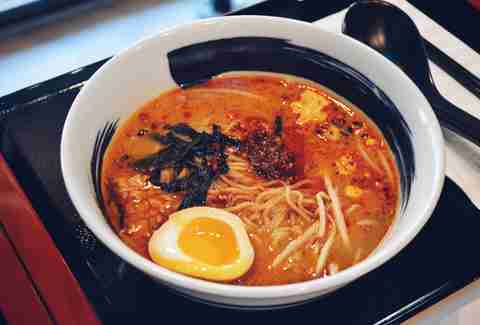 Choose from paitan chicken, chili chashu pork paitan, miso ramen (spicy or not), shoyu ramen -- and yes, even a vegetarian pumpkin ramen prime for fall in New England. 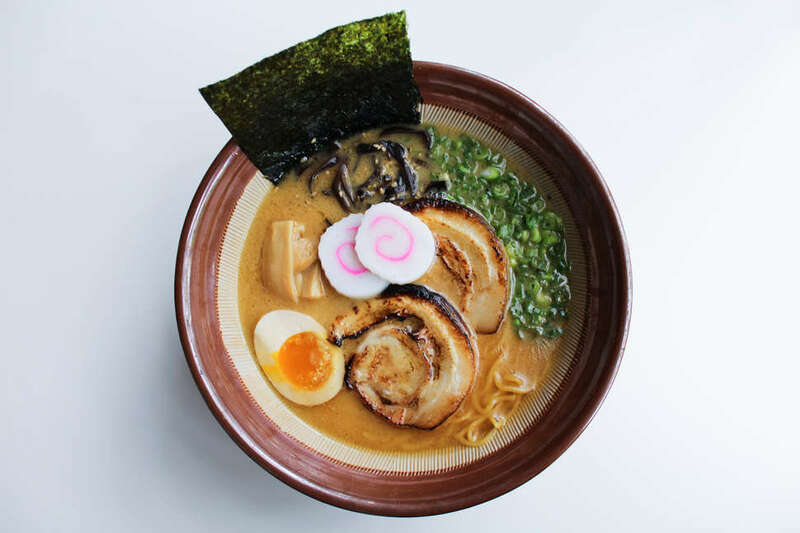 But, if you’re really hungry and willing to put your fate in the chef’s hands, upgrade to the Chef’s Ultra Ramen, which combines each of the options into one bowl. Add-ons are also available with each selection for a nominal fee. Once known as Snappy Sushi, then Snappy Ramen, the restaurant now combines both skill sets under one banner -- Snappy Kitchen. Snappy’s offers a wide variety of broths that suit the carnivore and vegetarian alike. Start with Spicy, Miso, Tantan, Veggie or Shoyu and build upon that base with nine add-on options that can satisfy even the pickiest and most refined palates. Ken Oringer and Tony Messina’s famous izakaya at the Eliot Hotel has long been revered for inventive (yet pricey) makimono, sashimi, and nigiri. A few years back, the duo decided to spice things up by introducing an affordably priced late-night ramen menu with local nighthawks and service industry workers in mind. Now, on Friday and Saturday nights from 11pm-1am, three options of ramen are written on a cardboard menu, placed somewhat in view, and that’s that. These late night offerings quickly became a local sensation and their cult following continues to grow as many in-the-know foodies cite this as the best ramen secret in town. 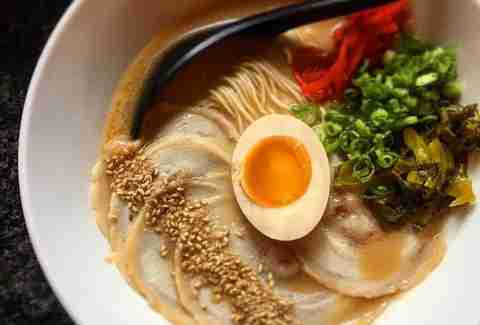 What began as a simple mission by founder Santouka in the 1980s to “make delicious ramen” has since spread around the globe and recently to two spots in the Boston area -- one in Harvard Square and one in Boston’s Back Bay. Instead of the often elitist take on the traditional fatty, salty, meat-heavy noodle soup, Hokkaido offers a variety of ramen that is often lower in sodium and proclaims a mission to offer more appealing options to health-conscious customers, children, and vegetarians. This is ramen for the people, and that being said, you may have to enjoy it at a large communal table with all of those other people. From traditional pork broth and soy-based vegan broth with mushrooms to a brothless ramen, your options here should satisfy everyone. With three locations in NYC, two in Taipei, and now two locations in the Boston area, Totto Ramen is quickly spreading influence over the world ramen community. 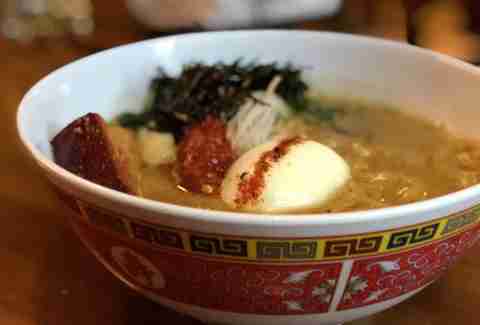 Specializing in paitan-style ramen, this is one of the thickest and heartiest broths in the city. Though it’s one of the few places without a pork broth option, you can still choose from four broths (three chicken and one vegetarian) and top your base with as much sliced pork as your hunger desires. Ken Oringer and Jamie Bissonnette continue to tingle your taste buds. Chefs and co-owners of Coppa and Toro (Boston, NYC, and Bangkok), the two opened Little Donkey a little over two years ago boasting a worldly tapas menu that includes eccentric takes on some already esoteric global dishes. If you’re looking for authentic ramen, keep looking, but if you want to try something different then you’ll want to sip and slurp your way through the matzo ball ramen. 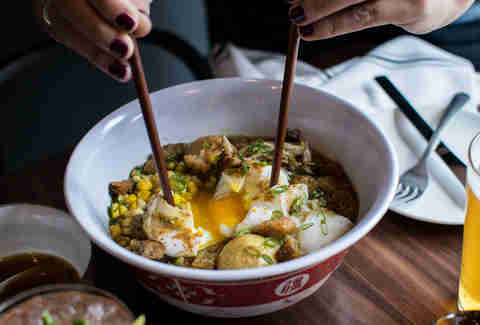 Made with chicken broth, burnt onion, schmaltz tare, and corn and fleshed out with spicy chicken, the hearty bowl comes in two sizes and has been heralded as a successful fusion of Japanese and Jewish staples. You really have to be really, really good to pull off a kitschy restaurant name, and CCB has done it. Quickly winning over the hearts of Central Square and Lower Allston, Chick Chick Boom is a welcomed spot for neighborhood nosh in an otherwise dead zone for food. When it comes to comfort cuisine, what better to scratch those itches than wings and ramen. While Chick Chick Boom boasts Parisian picnic tables and free wifi, their offerings are often enjoyed “To Go” as patrons head down the freshly groomed bike trail from Cambridge back to their Allston apartments. While their menu may not offer the most traditional styles of ramen, CCB does offer up some delicious Asian fusion options like the Green Curry Chicken Ramen and Honey-Glazed Pork Ramen. The best noodle shops in town tend to be backed up with some sort of local folklore that’s as rich as their secret broth. Tsurumen Davis is the most recent startup with a story to tell. Head chef, Masuo Onishi, opened this past spring and intriguingly said from the start that he will remain open for 1,000 business days before figuring out his next move. While we hope he sticks around, Onishi hails from Osaka and has lived in Honolulu and North Carolina, so it wouldn’t be surprising if he brings his noodles of joy to another town once those 1,000 days are up. Don’t think of this as deadline as much as a beautiful Japanese take on impermanence. At the least, it still gives you a few years to grab one of his traditional Osaka-style ramen bowls that has everyone in town talking. Then again, since he only serves 50 bowls per day and keeps the strangest of hours (noon-1pm and 6-8pm), it may just come down to being in the right place at the right time. Like everything good in life, this may take some effort, persistence and patience. Oh, and of course: cash only. Ganko Ittestu serves up traditional Sapporo-style ramen, and since Sapporo and Boston have similar climates, following these traditional recipes provide the perfect ramen for our fair city, no matter what the season. With strong attention to detail, each bowl of Ganko’s ramen allows the tare to caramelize with the vegetables while a base broth is added for a more aromatic flavor. Each meat is cooked at a different temperature and added at the appropriate time. And the noodles? Well, the noodles are none other than the much sought-after Nishiyama Seimen Noodles, which were selected to match Ganko Ittestu’s unique flavor profile. 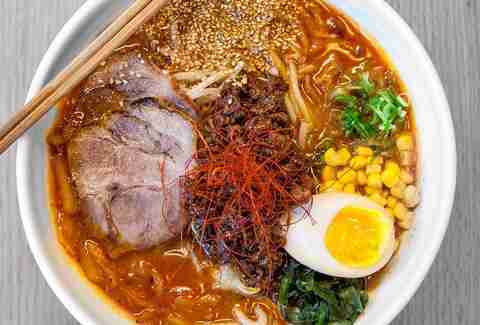 After “popping up” around town since 2015, chef Moe Kuroki finally found a downtown brick-and-mortar location for her ramen in early 2018. The cozy nine-seat nook is meant for a fresh, quick bite for those on the run, and very reminiscent of the street food experience back in her native Japan. While in Boston she’s worked with some of the city’s best noodle purveyors (many of whom are mentioned above), but now she has a place all her own she’s garnering some great reviews and getting the respect she deserves. The “Smokey” and the “Truffle” are available hot or chilled, and then, of course, there’s the “Oisa Tonkotsu” packed with pork, burnt garlic oil, sesame seeds, pickled mustard greens, soy egg, scallion, and pickled ginger. 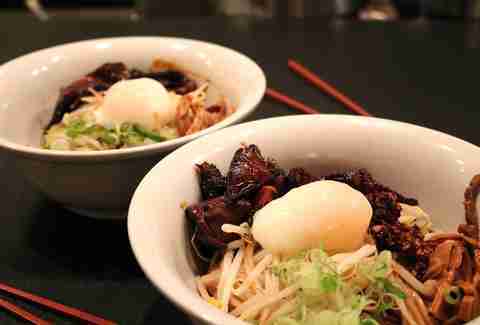 Oh, and by the way, Kuroki is also offering up four varieties of ramen salad bowls. Haven’t heard of that before? Us neither, but if they don't catch on, we’ll be surprised. Nolan Gawron is a music, travel, and scene writer for Boston and beyond. Follow him on Twitter @NolanSellsOut and on Instagram @blurred_visionary.